DuoFertility is a patent-pending, non-hormonal and minimally invasive passive medical device that allows women to accurately identify ovulation cycles, without daily observation. 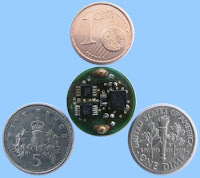 Picture of our prototype devices and coins - click for a larger picture Our current prototype devices are about the size of a US dime, 1 Euro cent, or a UK 5 pence piece. We believe that by eliminating these constraints placed on women by existing methods, the reliability of ovulation detection will be greatly improved. The DuoFertility system consists of a stick-on patch, about 3cm in diameter, which is worn discreetly under the arm. This patch contains a coin-sized circuit that automatically measures and records your body temperature every 10 minutes. When you want to know if you are fertile, you use the hand-held reader, which is about the size of a make-up compact, to read out the temperature data and analyse it, in about 30 seconds. It then tells you whether or not you have ovulated. You consult the reader at your convenience - there is no need to have it with you all the time, and you don't need to do it at any particular time of the day or week. We have developed and tested our first prototype patches on ourselves with positive results. We are now building test units, which we aim to place with women already trying to conceive. We are always very pleased to hear from women who are interested in what we are trying to do, and if you are interested in being a trialist please fill in our pre-trial questionnaire.